Work your way through Privateer's Hold and many of its monsters and other unfriendly residents to reach the exit. Work your way through Privateer's Hold. Kill or escape from any Monsters along the way. Exit the dungeon into the outdoors. After creating your character, you begin the game in a cave near a campfire. The first thing you should do is equip any weapons you have in your inventory and save your character. Go south and leave the cave; there is a secret door into another room at the end of the passage. The first enemy you will encounter is a rat guarding a treasure pile. Kill the rat and take the treasure, then climb up the stairs to the west. Proceed down the long corridor. After you kill the bat in the hallway, take the first door on your left. The door leads to a room with an imp, so if you don't have a steel weapon yet, you may want to come back later to avoid being killed by the imp's spells. There is also a treasure pile in one of the cages in this room. Follow the corridor further until you reach a second door. This second room contains a rat. As you continue, you'll see a third door and stairs leading down to the east. Go down the stairs to find a thief, who will drop some useful armor and equipment. Try to take him by surprise with a backstab, as he can be difficult at lower levels. Keep going down the hallway until you come to some stairs leading upwards. Go up the stairs and through the door to find yourself in a room facing an archer behind a U-shaped table. The archer will not walk around the table, so using melee attacks from across the table and quickly backing away can be a safe way to dispatch him. Now you are in a big room with a grand staircase leading to a throne on a platform (opening the door opposite the staircase is not recommended, as you will be greeted by a tough grizzly bear). At the top of the massive staircase is a skeletal warrior. Choose whether to fight or run; once you are past, jump onto the raised platform with the throne and pull the lever beside the platform. The throne will rise up, allowing you to reach the balcony above and move on to the next level. You can also try to climb the wall to reach the balcony, but it is safer and easier to use the platform. An alternative way to get past the skeleton is longer, but much safer. Go around the left side of the staircase, moving past the support and to the corner. To the right you can see a part of the wall on which the textures don't exactly match the ones around it. This is a secret door. Go through and continue straight until you pass through the brown passage. Watch out for the archers in the rooms near the start of the brown passageway. Climb the stairs and go through the door at the end, which leads to the balcony above the throne. Once you have reached the balcony, follow the corridor and take the first door you come across. This room contains a rat, a bat, and an imp. If you're quick, you should be able to lure the bat outside and kill it, then take out the imp and the rat. The exit looks like a cave with a skull in it along the wall. Exit the dungeon and the quest will be completed. 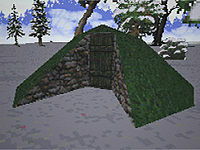 This dungeon acts as an introduction to the dungeon-crawling aspect of the game. By the time you leave, you should be at least level 2 and have at least a basic set of equipment. If you are healthy enough to continue exploring the dungeon, you should do so to gain more treasure and skill experience. However, be careful not to catch any diseases or poisons from the creatures in the dungeon, as you will not have any way to save yourself from dying at this point. The latest official Patch v1.07.213 still contains a bug in the Main-Quest which is triggered as soon as you leave Privateer's Hold. See here for further information and possible workarounds. Esta página foi modificada pela última vez à(s) 11h24min de 19 de março de 2016.